1. Which famous Russian female made around the world headlines after the 3rd of November 1957? 2.The two oldest universities in Europe are both found in which country? 3.Name the handicap that each of the following had to overcome..
4. Leningrad, Fort Sumter, Sarajevo and Massada are all examples of what? 5. Which drink is named after those who once owned large tracks of land in the eastern part of North America? 6.Who directed each of the following war films? 7. What kind of burst is the most powerful radiation known to science? 8. The sound of screaming demons leaving Regan's body in the film 'The Exorcist' is actually a recording of what? 9. All of the following have or had what in common? Van Gogh, Rod Laver, Queen Elizebeth I and Winston Churchill. 10. Why are 'quatorziennes' a welcome addition at the dinner table? 1. Laika. The Russian cosmonaut dog. 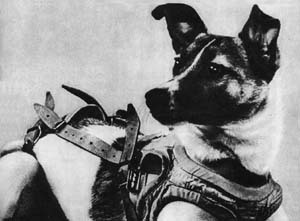 (or muttnik ) Laika (from the Russian: Лайка, a breed of dog, literally meaning, "Barker" or "Howler") was a Soviet space dog (c. 1954?November 3, 1957) who became the first living mammal to orbit the Earth and the first orbital casualty. Little was known about the impact of space flight on living things at the time Laika's mission was launched. Some scientists believed humans would be unable to survive the launch or the conditions of outer space, so space engineers viewed flights by non-human animals as a necessary precursor to human missions. The United States used chimpanzees; the Soviet program elected to use dogs. 4. Famous or infamous sieges. 5. Bourbon. (the house of Bourbon royal family). 8. A pig or pigs being led to the slaughter. The Exorcist is a horror novel written by William Peter Blatty. It is based on a 1949 exorcism Blatty heard about while he was a student in the class of 1950 at Georgetown University, a Jesuit and Catholic school. The exorcism was partially performed in both Mount Rainier, Maryland and Bel-Nor, Missouri. Several area newspapers reported on a speech a priest gave to an amateur parapsychology society, in which he claimed to have exorcised a demon from a thirteen-year-old boy named Robbie, and that the ordeal lasted a little more than six weeks, ending on April 19, 1949. 10. They are the 14th guest. Thirteen guests are or were considered to be unlucky. Quatorziennes are those who are ready to be called upon and save the evening.